We’ve all seen those epic fail videos online; videos showing people doing some pretty silly things. You don’t want to be included in that group when you are using trailer loading ramps. So learn how to use your ramps correctly. Otherwise, you could find yourself appearing in a viral video. For the record, trailer loading ramps take advantage of a few key laws of physics that make it possible to get heavy loads up onto a trailer without having to use a lift boom. Those laws can be just as much your enemy as your friend. It pays to know how physics relates to the ramps you are using and the load they will carry. The trailer ramps we sell are designed to be used with an aluminum skid seat and a locking rod. The reason here should be obvious: ramps need to be secured in place before any loading begins. Insecure ramps are almost guaranteed to fall away from the back of a trailer. Before securing ramps, check to make sure the skid seat and locking rod are in good working condition. Any abnormalities that even look like they might compromise skid seat integrity should be dealt with before loading begins. The laws of physics dictate that less force is needed to move a load the lower the angle of ascent. As such, avoid the temptation of trying to load at too steep an angle. If the angle of load is too high for a particular job, either use longer ramps or find a higher surface you can use as an intermediate step in the loading process. If neither are possible, another method of loading will have to be considered. Clearance is a big issue when loading heavy equipment onto flatbed trailers. The clearance we are talking about is the clearance that exists between the bottom of the load and the top edge of the flatbed. A lack of sufficient clearance could mean a load gets stuck half-way on to the trailer, creating a potentially dangerous situation. The way around clearance issues is to use ramps with arches built in. The arches lift the back of the load as it approaches the trailer, solving the problem of limited clearance. Moving a load up a set of ramps too quickly is a dangerous proposition. Uncontrolled speed could cause a piece of heavy equipment to veer out of control once it reaches the flatbed. It could cause the equipment to jump, subsequently leading to damage on impact with the trailer. There are just so many things that could go wrong here. So, whatever you do, make sure to control your speed when you’re using loading ramps to load heavy equipment. It is better to go too slow than too fast. It is better to load ramps with assistance versus going solo. Flatbed drivers should always have the help of at least two other people who can keep an eye on the ramps from either side. If you can get two more to watch the trailer as well, that’s a bonus. Trailer loading ramps are great tools for getting loads onto flatbeds. But they have to be used with caution and according to the laws of physics. Flatbed trailers are used to haul loads that do not fit well in dry goods vans. Consequently, cargo on the back of a flatbed trailer does not enjoy the same protection offered by four walls and a roof. 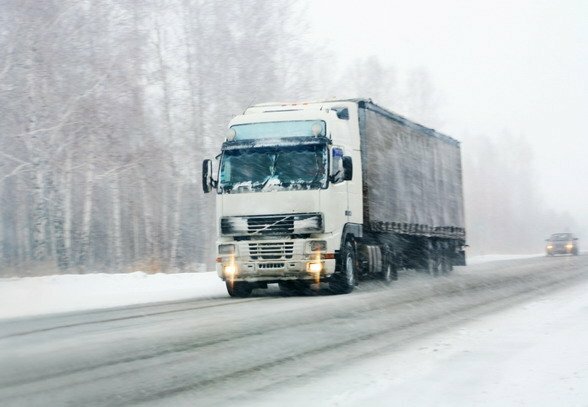 Drivers have to take the responsibility of protecting cargo themselves, using truck tarps and other cargo control supplies to protect what they are hauling. Construction equipment generally needs no protection as long as you consider machinery that is built to be out in the weather. Backhoes, loaders, and the like can simply be secured to the trailer and taken where they need to go. The same is true for most pieces of mining and drilling equipment. However, just about everything else needs to be covered and protected in some way. Finished machinery loads which include CNC machines, boilers, and industrial air conditioning units, must be covered to prevent damage from road debris and the elements. The best way to do this is with rectangular machinery tarps that provide full coverage across the top and all sides. As an added bonus, machinery tarps tend to be the most versatile. They can be used with the widest range of loads. Finished lumber and construction materials usually have to be covered with tarps even if shippers have covered them in plastic. Lumber tarps are the perfect tool as they are designed with flaps so as to cover the entire load – even in the rear. The only thing to watch out for with lumber tarps is that applying them can take longer so it would be best to have another set hands to help cover the lumber load. Flatbed truckers know that steel coil and tubing comes in many different sizes and configurations. A trucker might haul four or six spools of steel coil on one run, then turn around and carry industrial-grade tubing laid flat across the length of the trailer for the next job. Steel tarps are the best option for these kinds of loads. They come in multiple sizes, and their rectangular shape makes it easier to cover loads regardless of the configuration. Tarps can go over the top of chains and winch straps or be secured underneath. Deciding whether or not auto parts have to be covered depends on the shipper. New and used parts intended for installation will have to be protected from road debris and the elements; old parts destined for the scrap heap can usually make the journey uncovered. It has been our experience that standard machinery or steel tarps are the best choices for auto parts. Another thing flatbed truckers know is that there are those occasional odd loads that do not fit standards. For example, a trucker might have a trailer loaded with a combination of mining equipment and a vehicle for mine operations. The vehicle does not have to be covered, but the mining equipment does. Odd loads require a bit of creativity from the drivers who carry them. It is up to the driver to figure out the best way to protect the cargo with tarps, straps, and other cargo control supplies. Drivers are always required to protect their loads no matter how odd these tend to be. Mytee Products has everything flatbed truckers need to protect their cargo. Whether it’s steel, lumber or something completely out of the ordinary, we have the cargo control supplies you need to protect it.